I have been knitting, crocheting, spinning, and weaving away, but have not been writing posts on each of my finished projects. 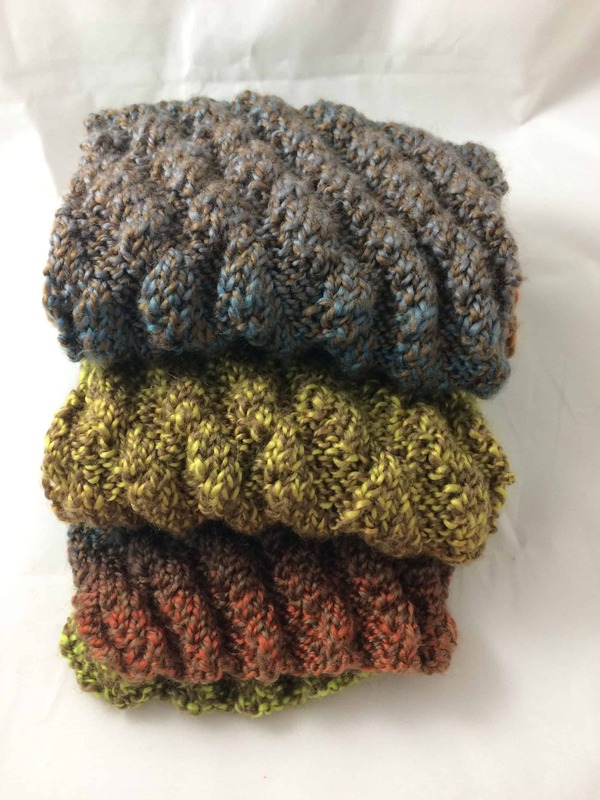 I received a private message on Ravelry, asking for the details of this project, so thought I’d write it up to share with all of you! I bought the Pinwheel yarn specifically to knit for charity. I got two skeins of most colors so I could make matching sets with a scarf, mittens, and hat. The scarf takes one skein and I can just squeak a hat and mittens out of a second. For three colorways, I only had one skein because that was all that the shop had. 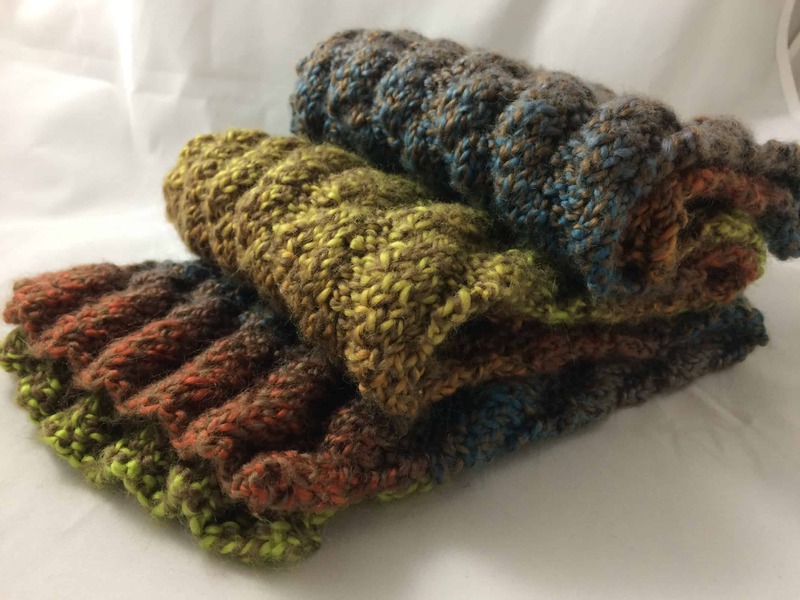 In September, I decided to knit up a couple of those skeins into scarves. I looked at the free patterns on Ravelry, but didn’t find anything that caught my eye that I hadn’t already knit. So I pulled out my Barbara Walker treasuries and found stitch patterns. This scarf uses the Traveling Rib pattern from page 180 of A Fourth Treasury of Knitting Patterns. When I first started this project, I planned to add a couple selvedge stitches, but after knitting the repeat a couple times, I didn’t like how that looked, so I ripped it out and started over, using just the stitches for the pattern. Ribbing isn’t going to roll and makes a nice stretchy fabric. It doesn’t really need a frame to give the fabric structure. This pattern uses a 7 stitch repeat. I’ve been casting on somewhere close to 40 stitches for all the scarves I’ve made with Pinwheel. This gives me a finished scarf of 5″ to 6″ wide and 60″ to 65″ long, depending on the stitch pattern. For this particular pattern, I assumed the ribbing would pull the fabric in so chose to cast on more stitches than usual. 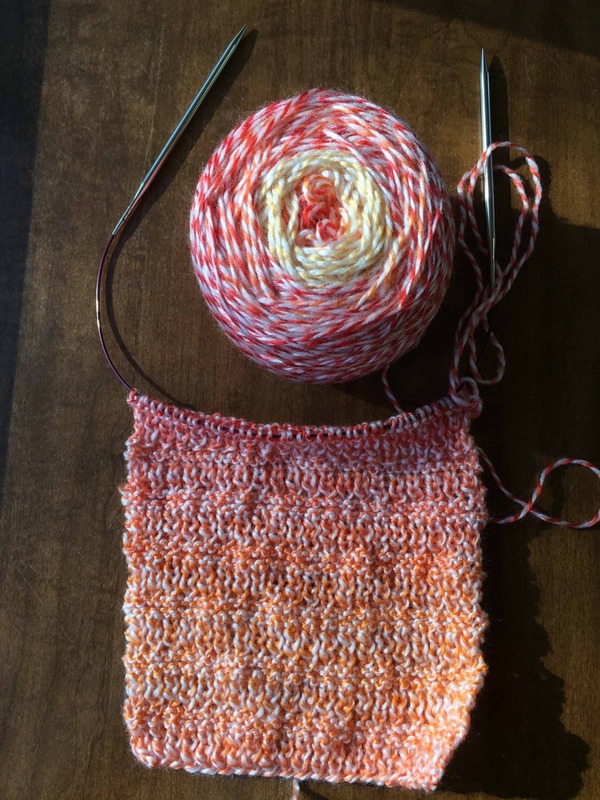 I cast on 7 repeats (49 stitches), using the long tail cast on, which is my default. Repeat Rows 1 – 14 until scarf is desired length, ending on either Row 6 or 13. BO loosely and in pattern. In this case, that means working Row 7 or 14 as written, and passing the preceding stitch over the just worked stitch as you work across the row, using larger needles if needed to keep your bind off loose. This scarf is reversible; I’ve only marked a right side and wrong side in the pattern to help keep track of where you are. If you look closely at the pattern, it may appear that rows repeat, but while the instructions repeat, you are on the opposite side of the fabric when you work it (Rows 1 & 12, 2 & 11, 3 & 10, 4 & 9, 5 & 8, 6 & 7, 13 & 14). As a result, if you put your work down and come back to it later, it may be difficult for you to tell where you are in the pattern. If you think you’re on Row 1 and you were really on Row 12 or vice versa, you will find that the direction of your rib changes midstream! You may want to mark the right side of the work, by hanging a locking stitch marker on that side. I finished the Emergency Scarf on June 1, but I haven’t blogged about it yet. I didn’t write a separate post about it; I didn’t include it in my FO Friday post. I wanted to write something a little different for this project, and I wasn’t sure how to do it. I’m still not sure what I’m going to write, but now that two weeks have passed, I think I’m ready to try. Needles: US 8, I think. I forgot to write it down! 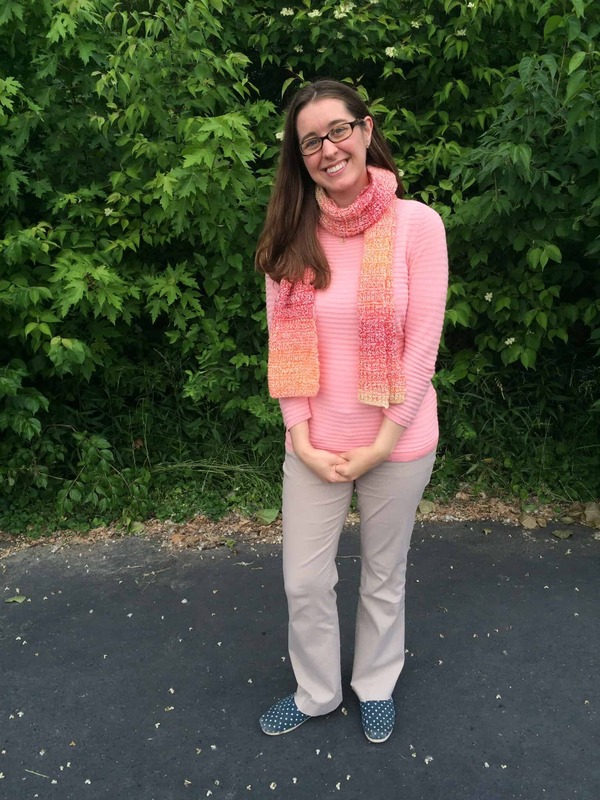 Stacy modeled this scarf for me, since it perfectly matched her outfit! Once upon a time, all the way back in 1996, a pretty little tortoiseshell kitten was born. She had a brother in her litter. He was black and white. They had a rough beginning, but then someone found them and took them into a house as foster kittens. When they were about 8 weeks old, their foster mama put them in a carrier and brought them to a different house. A man and a woman at the new house petted them and snuggled them. Then the tortoiseshell kitten and her brother went in a carrier again and went to yet another home, where the new man and woman lived. The adoptive mama called the tortoiseshell kitten Pepper, because she looked like freshly ground pepper. She called Pepper’s black and white brother Puck, because he was a mischievous little sprite. These were not the names the foster mama called them, but Pepper and Puck soon forgot that they used to be called Elvis and Priscilla. Pepper liked her new mama. To be honest, Pepper just liked people. Everyone who came into the house was a new friend. She ran up to everyone and greeted them with a loud meow. Most people petted her, and that was nice. Pepper and Puck moved with their new mama and papa to another place a few months later. Mama stayed in that house for a while, but the papa moved out. A while later, Pepper made friends with a visitor to the house. He didn’t just pet her; he let her climb on him and sleep with her head on his shoulder. This was how Pepper told mama that he was a nice guy. Pepper was happy when he became her new papa. He petted her a lot. A year passed, and mama and the new papa moved a long way. Pepper and Puck rode in the car with mama and papa for hours and hours. The car was scary, and Pepper was happy when she could sleep on papa’s lap, even if he was driving. The new place was nice. Pepper and Puck always lived inside before. The new place had a screened in patio. Pepper could see outside, and catch little lizards that snuck onto the patio. Pepper and Puck moved with mama and papa three more times after that. Tiger joined their family after the first of those moves, and Pepper wasn’t happy about Tiger. Even when he was little, he thought he was the boss of everyone. Pepper was really the boss! She reminded Tiger of this as often as she could. Mama and papa didn’t move again. Pepper got to live in one place for a long, long time. This house had a whole fenced in yard and on really good days, mama or papa would let Pepper out in the yard. She liked to sleep in the grass, chase lizards, and eat grass. Sometimes she tried to slip through the fence and see if the grass was better over there, but mama or papa always picked her up and brought her back to her own yard. Mama made Pepper nice beds to sleep on. Pepper was especially happy with the bed on top of the refrigerator. She could see everything that happened in the kitchen and dining room. Tiger didn’t usually try to come on top of the refrigerator, so she could stay away from him. Pepper got older, as happens to everyone. Her hips didn’t work as well and it was hard for her to jump up to the counter to get to the refrigerator. Mama and papa put a chair near the counter so it was easier for Pepper. Eventually, Pepper couldn’t jump on the chair. Mama and papa moved her bed to a table in the living room. When Pepper couldn’t jump on the table, they put a chair, and then a step beside the chair. After a while, Pepper got sick. She didn’t know what was wrong, but she went to the vet an awful lot. Everyone at the vet was nice to her. Pepper talked to all of them, and they pet her and cuddled her. She liked the massages she got. Her hips felt a little better after the massages. One night, Pepper did not feel well at all. Mama looked worried. Eventually, mama brought Pepper to the other vet, the one that is open at night. Mama brought her knitting with her. Mama often had knitting. Pepper liked the knitting. The balls of yarn were a soft place to sleep. After that visit to the vet, Pepper started sleeping in mama’s office at night. Pepper liked being away from Tiger. She liked having her own litter box, food dish, and water. But Pepper didn’t like being in only one room. When morning came, she was ready to get out of mama’s office and wander around the rest of the house. Pepper saw mama knit the scarf, and it seemed like it was done. It was still sitting on Mama’s desk though. Pepper heard mama say that the end needed to be woven in. The scarf sat on the desk for a long time. Pepper never did see the end get woven in. Pepper’s eye was bothering her, so she went to the vet again. Mama kept putting drops in Pepper’s eye, and Pepper didn’t like that. She wished mama would stop with the drops. Then Pepper started feeling worse, not because of her eye, but because of the other sickness. The one she’d had for a long time. She stopped eating. Mama seemed worried. Mama put food on her finger and tried to get Pepper to eat it. Pepper sniffed the food and licked her lips. It smelled good, but she didn’t want to eat. Mama brought Pepper to the vet again. The vet looked worried too. The vet took tests. Then the vet put warm things all around Pepper. That was nice, because Pepper felt cold. Pepper didn’t know it, but mama was at home worrying about Pepper. Mama made chocolate chip cookies and ate too many of them. She wove in the end on the Emergency scarf that had sat on her desk for so long. Later that day, mama and papa came to see Pepper at the vet. Mama brought the new bed she’d made last week, the one that was Pepper’s new favorite bed. Mama and papa pet her and cuddled her. It was nice to see them, and Pepper purred as she went to sleep for the last time. This is another of the projects that I finished up last week while my sister was here. I finished the knitting the week before she came, but still needed to weave in the ends. Easy peasy! I finished the Palindrome Hat that I made to match the Palindrome Scarf. I have just enough yarn to finish the Irish Hiking Mittens to complete the set!